rish faithful urged to imitate St Patrick and the great Irish missionary endeavours of past centuries and become 'missionaries of mercy' for today's world. Pope Francis, like St Patrick, is calling people of faith to be missionary and to go out to the peripheries, “accompanying the poor and the marginalised, touching lost lives with the fire of God’s love and mercy”, the Primate of All Ireland has said. 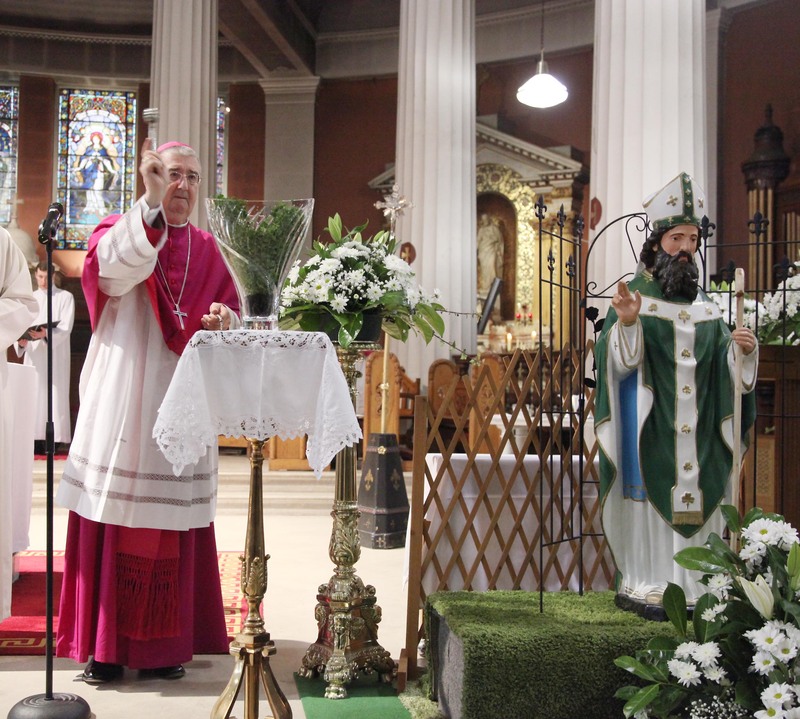 In his homily for St Patrick’s Day, Archbishop Eamon Martin acknowledged that on Tuesday, people all over the world of many creeds, languages and races were celebrating Ireland’s national saint, Patrick. “It is a testimony to the tremendous outreach to the rest of the world that Ireland has had over many centuries,” the Archbishop said on Tuesday morning in St Patrick’s Cathedral in Armagh. In a message to keep Irish eyes smiling, the Archbishop said that everywhere the Irish have gone “we have brought warmth and smiles, laughter and music, tales of our beautiful green island home – and devotion to the patron saint Patrick who first brought to them the Gospel of Jesus Christ”. Elsewhere in his homily, Dr Martin said Ireland’s greatest export down the centuries has been its people and its faith. 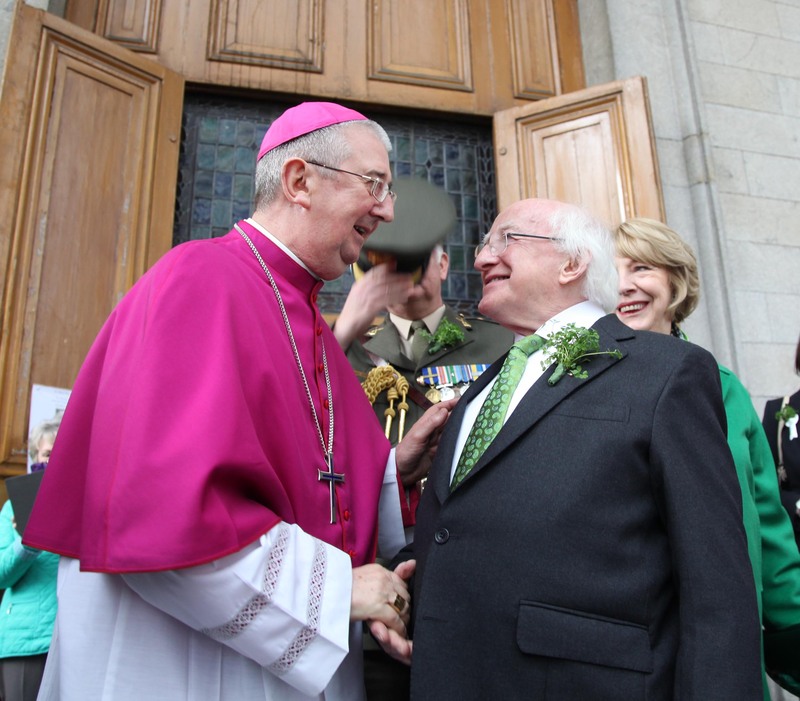 St Patrick’s Day morning Mass in the Pro-Cathedral Dublin was attended by President Michael D. Higgins and his wife Sabina. Pic: John Mc Elroy. He highlighted that this year marks the 1,400th anniversary of the death in Bobbio of St Columbanus, the great apostle of Europe. 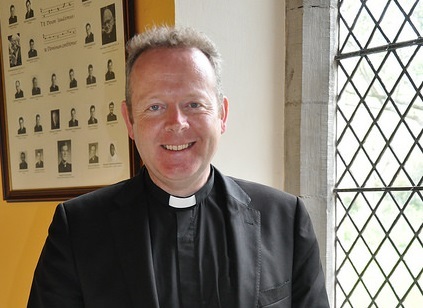 “During this universal Year of Consecrated life, parishes all over Ireland will be remembering sons and daughters who left these shores to give their lives to the great Irish missionary outreach across the world in the nineteenth and twentieth centuries,” he said. The Primate noted the similarities between St Patrick and Pope Francis in their emphases on being sinners and on mercy. Archbishop Diarmuid Martin blesses shamrock at the conclusion of St Patrick’s Day Mass. Pic John Mc Elroy. The Archbishop observed that it was this acceptance of God’s mercy in his life that allowed St Patrick to “make the choice to face every danger and opposition in order to introduce so many people to the love of God the Father, Son and Holy Spirit,” he said. He urged the Irish faithful, in imitation of St Patrick, and inspired by the great Irish missionary endeavours of past centuries, to rekindle their missionary zeal and become ‘missionaries of mercy’ for today’s world. “Mission is in our blood as Irish people,” he said. He also highlighted that there would be no renewal of faith in Ireland without a parallel renewal of mission, and that mission will be a mission of mercy, “one that is conscious of our sinfulness, weakness and need for God’s abundant mercy for ourselves and others”. The Primate offered his blessing and good wishes for St Patrick’s Day to the people of Ireland, to Irish people overseas and especially to Irish missionaries – lay people, religious and priests – “who are following in the footsteps of Saint Patrick in bringing the comfort and the joy of the Gospel of Mercy to faraway places”.